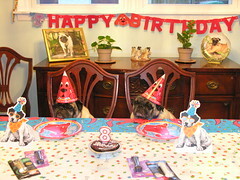 Middle: Pic sent in by Carol — Her 2 Pugs at their 8th birthday party on April 14, 2007. Frankie is on the right and Louie is on the left. The pug in the background picture is Obie her original pug. 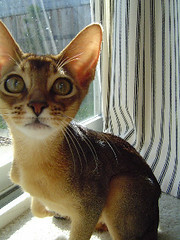 Obie died last fall at 15.5 years old. This entry was posted on Friday, May 4th, 2007 at 3:57 am	and is filed under Dogs, National Dog, Cat & Pet Info, Art & Pictures of Cats & Dogs. You can follow any responses to this entry through the RSS 2.0 feed. Both comments and pings are currently closed. Awww.. Leo is an adorable kitten, and the pugs in hats are too cute. Bungee looks like he was an awesome dog — I’m so sorry for your loss. I’m so sorry Bungee is gone. He looks like he was so loving. This nightmare has to end soon, just has to. I hope Leo and the Pugs will have many, many birthdays! The party looks like it was fun, lol! 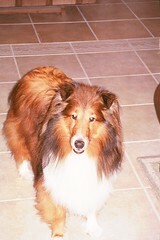 Bungee reminds me of Kosmo, my sheltie that died from kidney failure on March 26 from non-recalled Nutro dry dog food that DOES contain rice protein. My thoughts and prayers are with Bungee’s owner. I truly feel your pain.